The lives of Pit People are both short and cruel. 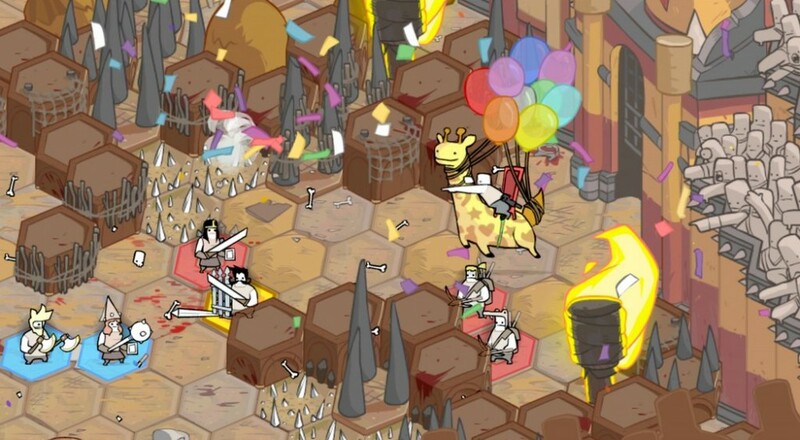 Forced to wage war on a hexagonal battlefield, watching colossal monstrosities crush houses and enemies alike, charging through the air on giraffes held aloft by a handful of balloons. These are all elements in the terrible existence of a Pit Person. Or, at least, they are if this perplexing trailer is any indication. Once labeled Game 4 by The Behemoth, Pit People finally has a fresh new trailer with its new name. Take a look. Just, don't stare too long. That way lies only madness. And now we're all insane. Good for us! Pit People comes to us in the form of a turn-based co-op strategy game, which are words that send delightful shivers down my spine. If you wanted to check out the gameplay, look no further than the first 20 minutes of it right here, which came to us over a month before the actual trailer. That's not how things are done, The Behemoth! You've got to set unrealistic expectations with the trailer first, then show off the gameplay! The team down at The Behemoth has a reputation for imaginatively bizarre gameplay (the deer section in Castle Crashers comes to mind), and I'm delighted to see they've just leaned into that. One of my favorite metrics of game quality is "risk of landing me in a psych ward," and Pit People might top that particular chart. Page created in 0.3391 seconds.